Our professional range of Ducting Push Cameras meet all of your needs you would expect from a German made inspection system. Call or email us today find out more about Wohler camera systems and we are sure to be able to assist you. SnakeEye II Pole Camera (without image capture) ..
SnakeEye II Pole Camera (without image capture) Is a low-cost hand held remote video inspection system. It's lightweight, modular and portable design allows its operator to take it anywhere to carry out inspections. SnakeEye "lets your eyes travel where you can't." Combining a CCD camera..
OWN Yours today for only $140.03 Per Month with ..
OWN Yours today for only $140.03 Per Month with FlexiCommercial, phone us to inquire. Wöhler's innovative VIS 200 general purpose entry level service camera enables you to easily analyze damage in pipes of Ø 40 mm and larger – with no power outlet required. Compact by design an.. The Wohler VIS350 26mm Forward View Camera Head System.. 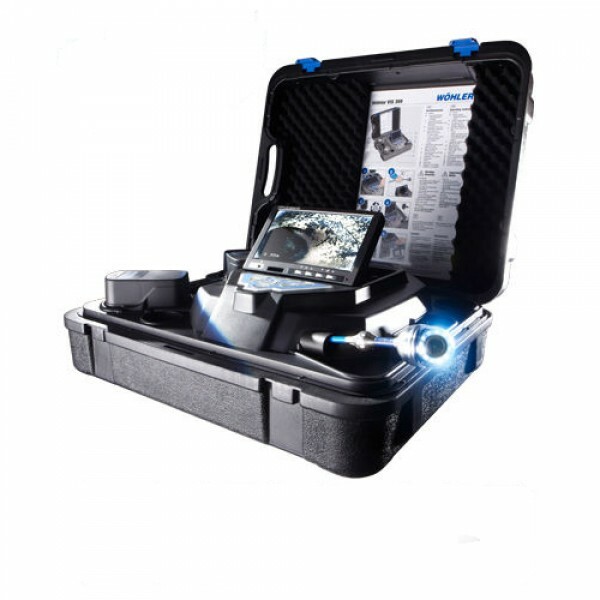 The Wohler VIS350 26mm Forward View Camera Head System is a compact and advanced drain camera system that illuminates dark spaces allowing you to take a closer look inside drain and sewer pipes, ideal for plumbers and drainage contractors.The industrial camera kit features a colour camera h.. The Wöhler VIS 700 inspection camera offers what th.. The Wöhler VIS 700 inspection camera offers what the professional has been waiting for: sharp images in HD quality, a focus function that precisely focuses on the point, and a practical control of the rotary / pan camera head via the joystick, Ideal prerequisites for the inspection of sewage..
SnakeEye III Pole Camera (with image capture) ..
SnakeEye III Pole Camera (with image capture) Is a high resolution hand held remote video inspection system with integrated image storage capabilities. Lightweight, modular and portable, SnakeEye III "lets your eyes travel where you can't." Combining a CCD camera and TFT-LCD display tech.. The carry strap around your neck and the monitor in fr.. The carry strap around your neck and the monitor in front of your chest, one hand guides the camera cable, the other precisely controls the pan and tilt camera head via the typical Wohler keypad: That is how stable the new Wohler VIS 400 video inspection camera is and how easy it is to work with ..